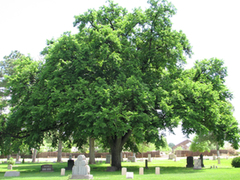 This Tree in Colorado: American elm continues to grace the streets and avenues of our cities and towns. Its characteristic vase-shaped branching habit makes it a superior street tree. 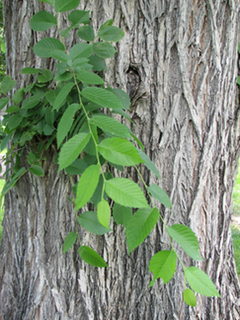 Dutch elm disease wreaked havoc on the large leafed elms for the last 60 years. Many city streets lost their beauty and shade. However, good sanitation practices now make it worth attempting growing elms once again in our parks, along our streets and in our yards. Hardiness: Zones 2 to 9. A wide range of temperature tolerance. Growth Habit: A graceful vase-shape in most situations. Other varieties can be spreading, pendulous or upright. Foliage: Simple; alternate; oblong-obovate; 4″ to 6″ long, 1″ to 3″ wide; deciduous; coarsely doubly serrate margin; dark green; glabrous or slightly rough above. Flowers: Samara about 1/2″ long; oval; a flat thin wing around the see, wing hairy-fringed and notched at tip. 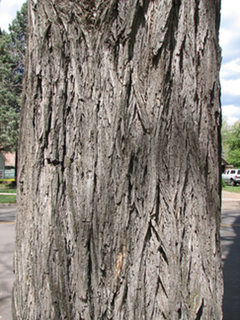 Bark: Ash-gray; divided into flat-topped ridges with diamond-shaped furrows in between; a broken piece of outer bark will have alternating light and dark layers. 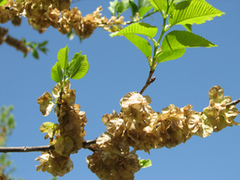 Insects and Diseases: New cultivars and hybrids show various levels of resistance to Dutch Elm Disease. Leaf miners, European Elm Scale, and aphids are common problems associated with American Elms in Colorado. Landscape Value: This tree sill has landscape value. With the ability to control the spread of Dutch elm disease, more cities are replanting these majestic trees. They possess excellent branching habits over streets and sidewalks. 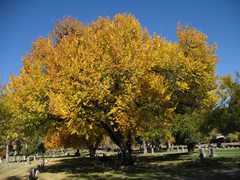 The only down-side to elms are the insects and diseases that affect them. But still, American elms are a stately tree and should be replanted. However they should not be replanted to a monoculture density as they were in the past.